Here we are — the first real bout of adversity this season. 2. This was going to happen at some point this season and it’s better it happens now than in late March/early April. A little adversity won’t hurt this group, and the lesson they were handed tonight (long-term, the loss is probably more valuable than pulling off a win after tying the game at 3-3) was one it needed to receive. They can’t just skill their way to wins against good teams. 3. 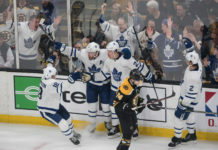 One of the things we’ve been harping on since last season in this space is the need for the Leafs to evolve their roster to maintain their level of skill but add different layers of useful skillsets: players that can skate, hang onto a puck and make a play, but also hit with bad intentions and have some physical investment in the game. This is not a knee-jerk reaction. This is what we were reminding readers of when fans were saying in October: “WHAT’S YER LEO KOMAROV DOING FOR YOU NOW,” and thinking the Leafs were going to out-skate/skill everyone all the way to the Cup as they perfected their rush-chance brand of hockey in the extended preseason. (Not suggesting the Leafs should have signed Komarov to the contractual terms NYI gave him. It’s just an example). 4. When the game gets away from them — no legs, back to back, just-don’t-have-it-tonight — the issue is that the Leafs can’t often throw molasses on the game and play it on the walls. They can’t get all four lines cycling consistently, they can’t stop a cycle easily enough at the other end, and they can’t make a series of hits to change possession and turn momentum. 5. The scouting report on the Leafs: If you make them play below their own goal line in tight cycle plays or on the wall, they can be exposed. They don’t like giving or taking hits. This is not just a stretch of poor play; this isn’t even about the recent results specifically. This is about their identity and what will and won’t work come playoff time. It’s about bringing out more of the skill in the lineup, not reducing it. 6. If the team is not feeling it offensively, they need to be able to provide a momentum shift via avenues other than scoring pretty goals. The Leafs, when they are “machine-like,” are going to dust aside most teams in the league. In the playoffs, they’re going to have to be able to play multiple styles of hockey — at least to some degree — be adaptive, and give different looks to different opponents. Playing whistle-to-whistle will work against most teams in a league that is becoming far more conducive to that style of hockey, but if they are to have ultimate playoff success, as it stands, they will be the first team in memory that is unable to adequately respond to a physical challenge and still win a Stanley Cup championship. 7. Boo’ing Jake Gardiner is typical fan scapegoating and missing the forest for the trees when it comes to the larger issues with the team’s overall makeup. 8. There are issues here that will need to be solved by the coaching staff (the PP is a not-insignificant part of the problem at the moment), simply through time, patience and maturation of the young core, and through the right managerial alterations to the lineup (the right forward with some skill and jam and a RHD puck mover being the main foci). 9. The idea here is to get more than one line going offensively while switching up the matchup approach after the Tavares-Marner line lost their matchup against another upper-echelon line tonight. This gives the team two lines that have been proven to be effective over significant periods of time, while hopefully getting Kadri engaged again in the matchup role he relishes. It’s an undeserved downgrade in Tavares’ quality of linemates, but he’s not exactly playing with stiffs and we know Tavares will put his head down and make just about any situation work. 10. Tampa Bay is on deck Thursday, and it’s an interesting time to run into the far-and-away best team in the league at the moment. With their recent home form, getting away on the road is probably coming at just the right time for the Leafs.